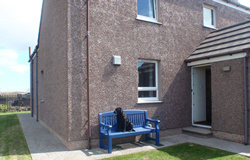 Fully furnished and comfortable house situated in Creagorry just 5 minutes walkfrom the South Ford causeway which links Benbecula to South Uist. It offers a fine panoramic view of the ford. It is an ideal central location for visitors to explore all activities in and around the islands. - Lounge with an open fire, freeview and DVD television, radio and CD player. - Downstairs there is an ensuite double bedroom. - Upstairs there are a further 3 bedrooms – 1 twin bedroom, another with a shower and vanity sink and a double bedroom with shower and vanity sink. - There is a bathroom with shower. - Storage heating throughout the house. - All bed linen, towels, toiletries and hairdryer are provided. - There is a small garden enclosure with outdoor dryer. - There is ample private car parking at the rear of the house as well as the old byre for storage of outdoor equipment and gear. Well behaved pets are very welcome at an additional charge by prior arrangement. There are several amenities closed by – the co-op, the puffin crafts shop, Liniclate community school which offers library with internet access, cafeteria, swimming pool, fitness suite, sports hall and outdoor track. The house is 8 miles from Balivanich the main village.